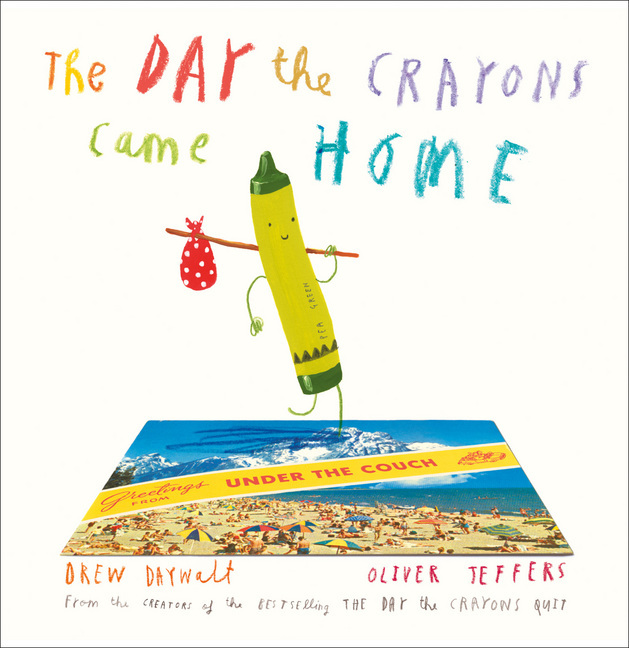 I absolutely love The Day the Crayons Quit, the hilarious collaboration between Drew Daywalt and Oliver Jeffers about Duncan and his crayons. If you haven’t seen this picture book you need to grab a copy IMMEDIATELY! It features letters for Duncan, written by his crayons who feel overused, underappreciated and unhappy. When I saw that Drew and Oliver were publishing a follow-up I was super excited! The Day the Crayons Came Home is out now and (if this is possible) even funnier than the first book. The Day the Crayons Came home starts with Duncan and his crayons colouring happily together, when a stack of postcards arrives in the mail for him. What follows are postcards from Duncan’s crayons that have been lost, forgotten, broken – even melted in a clothes dryer and stuck to a pair of underpants! There are postcards from Pea Green Crayon (AKA Esteban the Magnificent), Neon Red Crayon, Glow-in-the-Dark Crayon and Big Chunky Toddler Crayon and many more. Duncan must come up with a creative way to make his crayons feel included. This is a brilliant picture book! I couldn’t get through the book without laughing – in fact, every page had me cracking up. It is a perfect combination of text and illustration and it’s very clever. Drew Daywalt has given each of the crayons a very clear voice and they’re each very distinctive. It certainly comes across how angry, upset or totally clueless the crayons are. It’s so hard to pick a favourite crayon but I think mine would have to be Pea Green Crayon or Esteban the Magnificent as he likes to be called. Oliver Jeffers’ artwork is stunning as always. His illustrations are full of humour and add extra character to each of the crayons. There are lots of little details to love about Oliver’s illustrations, from the crayon end papers, to the hand-drawn text and the use of real postcards. One of the coolest aspects of this book is that there is a special glow-in-the-dark drawing on one of the pages that will be a lot of fun to share with kids. The Day the Crayons Came Home is one of those rare picture books that children of all ages will love and adults will only be too happy to read it over and over again. I know I’ll be sharing it with as many children as possible. The Day the Crayons Came Home is available now from HarperCollins NZ.